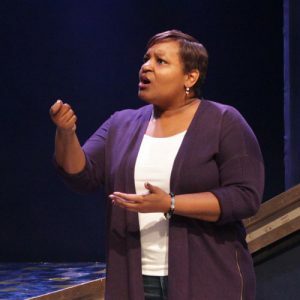 Tandra is from the great southern metropolis of Atlanta, GA. She stepped into the improv world in 2015 by attending a WIT Improv for All workshop followed by her first WIT class. She’s been in love ever since. Tandra has completed all five levels of the WIT curriculum, and even took a couple of the classes twice. She has performed with the now defunct indie team Just Us for ALL and currently performs with indie teams Insect Fight Club and the group formerly known as Kayne’s Sistas. During daylight hours, you can find Tandra working her job as a researcher or volunteering to make the world a better place.